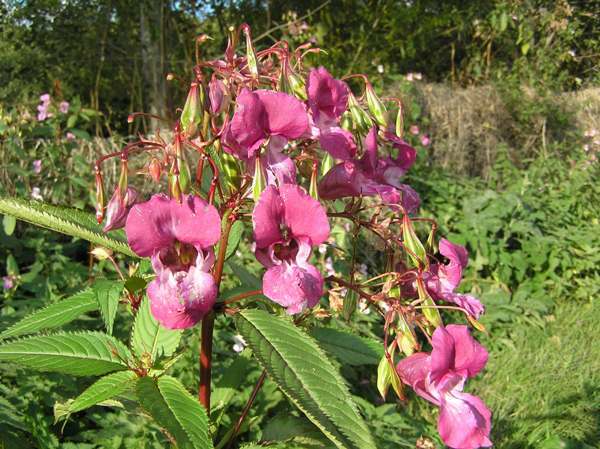 This escapee from Victorian gardens hascovered much of Britain, and it spreads particularly rapidly along riverbanks. It was first brought to the UK from the Himalayas in 1839. 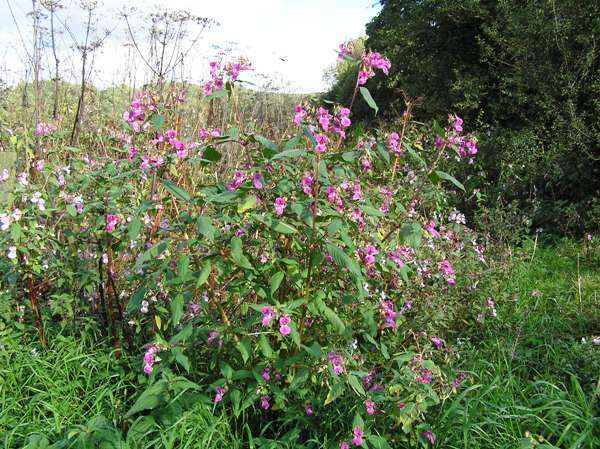 Himalayan Balsam is an annual and every year new plants grow from seed, but they soon reach and often exceed head height. 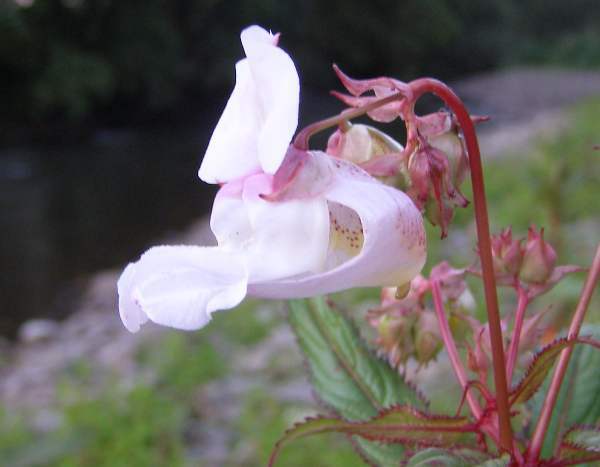 The hooded pink flowers are 3 to 5 cm long, and the stems are increasingly redder towards to top of the plants. Broadly lanceolate leaves are prominently veined and grow in pairs up the hollow stems. Equally described as a blessing that brightens up otherwise boring urban water courses or as a conservationist's nightmare, this is a visitor that has a future in our countryside when many feel it has already outstayed its welcome! In spring tiny seedlings emerge, and at that time they are most easily destroyed by pulling them out and burning them. The attractive flowers (sometimes called 'poor-man's orchids') appear in July, and by October their ripe pods have burst, scattering seeds not only around the plant but also onto the water. That is why control is only feasible by starting in the headwater streams and working down to the estuary... a mammoth task. Some think that the flowers have an attractive scent whilst others find it nauseating, but it is late in the season when the seed-heads are exploding that the plants smell at their worst and give off an obnoxious 'oily' smell that is particularly noticeable late in the evenings - a most unpleasant accompaniment to a night's sea trout fishing! 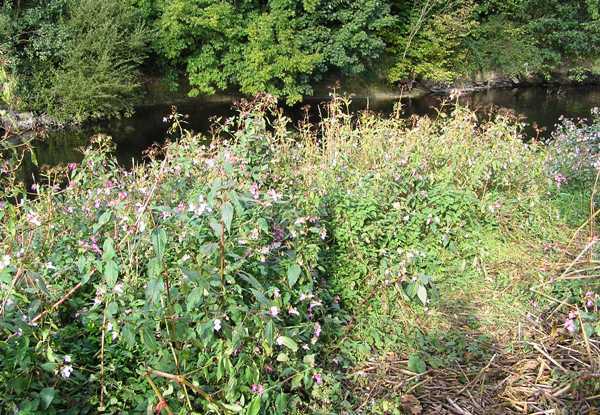 The banks of the River Teifi in West Wales are being smothered by Himalayan Balsam to the detriment of native stream-side flowers. The specimens shown on this page were photographed in West Wales in July.